Jews of Malabar: David Ezekiel Rahabi, The Cochini diplomat. David Ezekiel Rahabi, The Cochini diplomat. Ezekiel Rahabi is noted for his role as merchant and diplomat who worked for the Dutch East India Company nearly for 50 years. As a successful Merchant Rahabi traded cardamom, pepper, sugar, sandalwood and other commodities; he signed his memoranda in Hebrew which are still there in Amsterdam. It is believed that his Grandfather Ezekiel Rahabi Ist came to Cochin from Aleppo, Syria in 1646 leaving behind his wife and young (third) son David Rahabi Ist. After his father's death in 1664, David came to Cochin. Rahabi, the father, donated money not only for synagogues but for churches as well (unheared of in the 18th Century, though less rare in mordern USA) "
They were the richest merchants in Cochin, (who were also diplomats and bankers), settled there in 1646, and had been in the service of the raja of Cochin and the Dutch East India Company since 1664. Ezekiel Rahabi IInd’s son David Rahabi IInd wrote Ohel David . Indian calendar-maker; born in the state of Cochin about the middle of the eighteenth century. When Ezekiel Rahabi died (1771) David took over the management of his business, devoting, however, considerable time to his studies also. He is known through his work "Ohel David" (Amsterdam, 1785), which treats of the origin of the Hebrew calendar. During his period, Ezekiel Rahabi (1694-1771) made a major contribution to the community, not only in the economic and diplomatic areas but also in the socio-cultural and religious spheres. 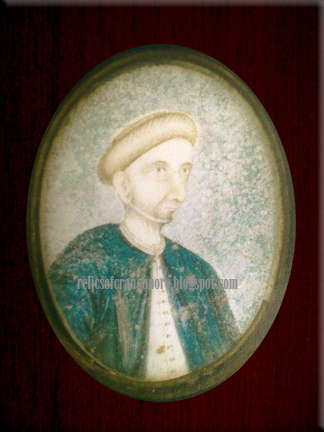 In the diplomatic sphere, Ezekiel Rahabi contributed to re-establishing peace with the local rajas, in times of tension in 1734 and 1742 he met the raja Travancore Martanda Varma and in 1751 the Zamorin of Calicut. When, in 1766, Hyder Ali, the new ruler of Mysore and the most radical opponent to the British attacked Kerala, the ruler of Cochin chose Ezekiel Rahabi as an ambassador entrusted with two hundred thousand rupees and eight elephants. Ezekiel sent his three sons to Hyder and placed in their hands diamonds and saltpetre (white sugar), a very rare commodity then. Thus he had acted ideally to put the attack to an end, in peaceful manner. The Paradesi synagogue’s restoration was completed by Ezekiel Rahabi in 1730 AD, after the destruction in 1662 AD and partial restoration by Shem Tov Castillia in 1668 AD. In 1760, the famous clock tower with Hebrew, Roman, Arabic and Malayalam characters was erected. Two years later i.e. in 1762 AD, Ezekiel Rahabi, imported 1,100 non identical hand painted blue willow-patterned tiles from Canton, China and paved on the floor of the Paradesi synagogue. In 1747 When Cochin’s Syrian Christians wanted to send for a new bishop from Basra in Iraq, Rahabi personally provided for his passage. This also shows the broadmindedness of Ezekiel Rahabi. Ezekiel Rahabi had a large number of Hebrew prayer books and Bibles regularly purchased and shipped from Holland. David Ezekiel Rahabi were instrumental in revivifying Judaism among the Bene-Israel as was also in contact with Arabic speaking Jews of Baghdad. Ezekiel Rahabi died, his third son David took over as the principal merchant of the Dutch East India Company, but the Dutch rule of the Malabar coast was already beginning to wane.